Two reports – one on the most expensive rental markets in the world, and the other on the top multifamily “Sell Markets” in the US – have the same winners: San Francisco and New York City, where the dynamics have changed and, for landlords, are veering for the worse. 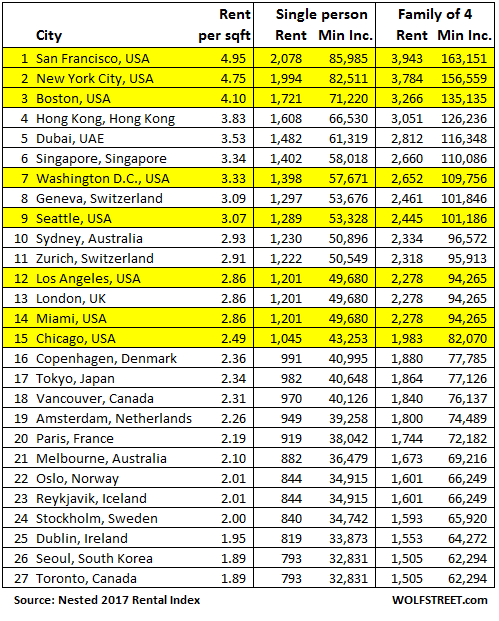 Of the 120 global cities researched by online property service Nested, the top three most expensive rental markets are San Francisco, New York City, and Boston. They easily blow away other global hot spots such as Hong Kong, London, Tokyo, Paris, Vancouver, and Toronto. After years of soaring rents in the US, eight US cities are among the 15 most expensive rental markets. To measure affordability, Nested’s report compares the cost of rents per square foot. Based on the minimum recommended dwelling size for a single person (420 square feet or 39 square meters) and for a family of four (800 square feet or 74 square meters), the report calculates the minimum incomes required to be able to rent in these cities (with rents not to exceed 29% of gross salary). The table below shows the top 27 cities in Nested’s 2017 Rental Index. I chose the top 27, rather than the top 25 or 20, to get Toronto on the list. We’ve covered the ballooning house price bubble in Toronto (#27 on the list) and the now deflating house price bubble in Vancouver (#18) many times, most recently with the January numbers. Both cities measure among the most expensive in the world in terms of house prices, but are way down in terms of rents. This is another indication of just how precarious their house price bubbles have become. Since the table is in US dollars, exchange rates influence the rankings. But it’ll do for our purposes. Within the US, these three most expensive rental markets are the same in other reports I have cited. So there’s some rare agreement in the data. And in these markets, rents have begun to drop sharply, though they’re still soaring in Mid-Tier Cities. San Francisco and New York have gotten so ludicrously expensive, and have so much new supply coming on the market, just as their economic growth has begun to slow, that they’re now the top two SELL markets for investors, according to Ten-X Research’s report and outlook. The Bay Area is seeing high development and is the most exposed to a change in cyclical dynamics. NYC and Boston are seeing building booms, while Northern NJ will struggle as availability in neighboring NYC rises. Miami too is seeing high development at the wrong time cyclically. As development rises, most markets will see vacancies creep higher, slowing rent growth. It appears the apartment cycle is drawing closer and closer to the end. Apartment vacancies “have been rising steadily” from just above 3% in 2012 to 4.4% now. Vacancies have risen nearly 2 percentage points from recent lows to 4% in Q3. Another city subject to Bay Area dynamics. While metro employment is up nearly 3.4% year-over-year, job growth is now decelerating. Effective rents are at an all-time peak, “but growth has already decelerated and will continue to slide as vacancies rise. OBAMA Left LEAKERS In The White House To Wreak Havoc For The TRUMP Administration – Jason Chaffetz Will Get Them!